And those who tell us that PEDv can't spread to humans should note that the H1N1 swine flu of 2009 is now showing up off the coast of Washington in sea otters. How alarmed should you be about the corona virus that's killed seven million baby pigs in the last year? So far it hasn't mutated into anything that can infect humans. But that doesn't mean it won't. Or that another one won't. Pigs are very good at catching the flu from a human, then catching another flu from a bird, and then mixing them both up into a new and more dangerous strain that can be passed back to humans. That's what happened with the H1N1 swine flu that raced across the country in 2009 after being incubated at a factory farm in Mexico. Porcine Epidemic Diarrhea virus (PEDv) is a horrible sickness that invades the gut, preventing the victim from absorbing fluids, while causing vomiting and diarrhea. At least 8 out of 10 baby pigs who contract it die from dehydration. Adult pigs usually survive. It's also highly contagious. According to Rodney Baker, swine biosecurity specialist at Iowa State University, "Something like a tablespoon of PEDv infected manure is roughly enough to infect the entire U.S. hog herd." And there's no vaccination against PEDv. Pigs can sometimes acquire some "natural" immunity by being fed the guts of infected pigs in what's called a "controlled exposure" to the disease. This involves the innards of the dead piglets being ground up into a kind of "pig smoothie" and forcibly fed back to the babies' mothers. No one is quite sure exactly how the virus landed in the United States. A less dangerous version was around in Europe a few decades ago but died out as pigs developed some immunity. It's most active now in China, which is probably where the new epidemic came from. And it could be being spread in pig feed that's shipped around the world and that contains dried pig blood. Not exactly a natural diet for pigs. And the same dried-blood feed is shipped to Europe, where the American outbreak is causing consternation. How is PEDv affecting the pork industry and the human food supply? Pork prices are rising, and the CEO of Tyson Foods, the nation's largest factory farming/slaughtering outfit, says that "production" of pork products will drop at least four percent this year. According to Reuters, farmers talk of being devastated by the outbreak. One farmer lost 7,500 piglets just after they were born. Another lost 12,000 in three weeks. "It's a real morale killer in a barn. People have to shovel pigs out instead of nursing them along," said John Goihl, a hog nutritionist. But none of what's happening should be a surprise in a world where pigs are simply resources in a vast global production line that's as filthy, disgusting and unhygienic as it is desperately cruel and inhumane. 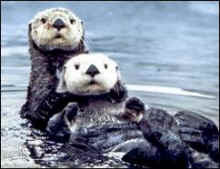 One possibility is that the otters caught it from elephant seals who have also tested positive for H1N1. But then how did the elephant seals get it? More and more, as human population balloons and we treat other animals in ways that are dangerously unnatural, diseases are spreading in ways that have never been seen or imagined, and that are already way out of our control.